What fun that you and I both love gardening. Thanks for joining me. 1) Don't mention the weather! Like the snowman above, much of the Northern Hemisphere is wishing they could farewell the awful weather this winter. My sympathies to you, and I will try not to complain on this side of the world about the rather unsummery erratic weather we are having. and impressing others with their artichokes. and experience heaven with their warm new potatoes. I too have now grown; into a gardener. Thank you Heidi from Newtown, I feel happy now. The term raised gardens is tossed around a lot. It can mean anything from a box on the ground to a layered mound. No dig gardens are naturally a bit raised so they fit the picture too. Have a read here about the four most popular no dig/raised bed ways of growing veggies. One packet of say, lettuce seeds, costing similar to one bag of ready-to-eat salad leaves, will grow you around 1000 lettuces. If you calculate the time and energy used to go and buy these salads, it's not the same as enjoying the outdoors in your garden, catching some sun (hopefully), getting exercise, and that connection-to-the-earth satisfaction. Yet more reasons to grow your own salads: There's no waste packaging. A chlorine or other chemical solution is used by manufacturers on packaged salads, and they also advise you to wash the contents of these bags again before eating. The rinsing you might need to do for your garden salads is minimal. If you don't fancy a bit of extra protein and you really do need to shift stubborn insects, soak your leaves in a 1 teaspoon to 1 litre of water salt solution for 5 or so minutes. Where did I plant those...? If you don't mind your garden looking a bit like a rubbish tip... but you're into recycling, yay, then cut out rings from plastic containers with strong kitchen scissors, or cut circles out of plastic pipes with a saw, and use in garden. Why? 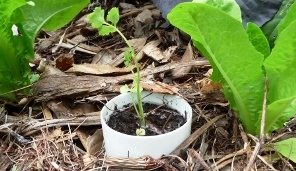 Because they make excellent protectors and markers for small seedlings or seeds. Sometimes you might want to plant a seed or two with wide spacing, so place the 'ring' down, put in seeds and cover with fine soil. This can be done in rows or if you want to plant amongst other vegetables. Now you know where your plants are. Simple and quick and if you let others have some too your popularity will soar. Mix cream cheese with garlic, spring onions, olives, cayenne pepper and capers. Put bread or pastry squares on oven tray and dollop each with this mixture allowing a small border. Top each with a tomato slice, sliver of blue cheese, and dash of black pepper. Bake in pre-heated oven at 200°C for 10-12 minutes. Happy gardening and here's to better weather.